Otavalo Indigenous Market and Town of Salinas – Ecuador – February 7 & 8, 2015 - Blog from Salinas, Ecuador | South America!! The city of Quito, the second Inca capital, is built on a plateau and is surrounded by mountains. At this time, it is rainy season and it rains in Quito, surely, almost every day. A few miles away, however, there is no rain. The city of Quito seems to be very beautiful, very beautiful! According to our guide, our hotel was the first hotel built in Quito in the 1960's. Thankfully it has been well-kept and regularly renovated. It is a classic 60s beauty. It has a certain "Jetson's look" out front with a large geometric entry cover in a deep shade of purple. I know it sounds gauche, but actually it is very attractive. In the rear, it features nicely landscaped grounds with palm trees, a huge heated pool, a sauna and cloud topped mountains in the background. Quite a royal view. The "included" breakfast today was like Sunday Brunch - FANTASTIC. But we are not accustomed to eating a big meal at 6 am—maybe tomorrow. Our "pick-up" for today's activity was scheduled for 7 am. We were a bit ticked with the pick-up time since we were scheduled for only a 5-hour tour. When the guide arrived, we found that Sunday's 5-hour activity had been switched with the Monday (10-hour)outing.. Grrr! But at least we will have a civilized pick-up time tomorrow. We drove out of the City of Quito into the high hills, clear skys and then down into the valley below. The scenery was great - mountains and valleys. Our first stop was the town of Otavalo which happens, by the way, to be a wealthy little town. They are a major world-wide exporter of expensive Vicuna, Alpaca and Llama goods. There we boarded the Ibarra Salinas train. 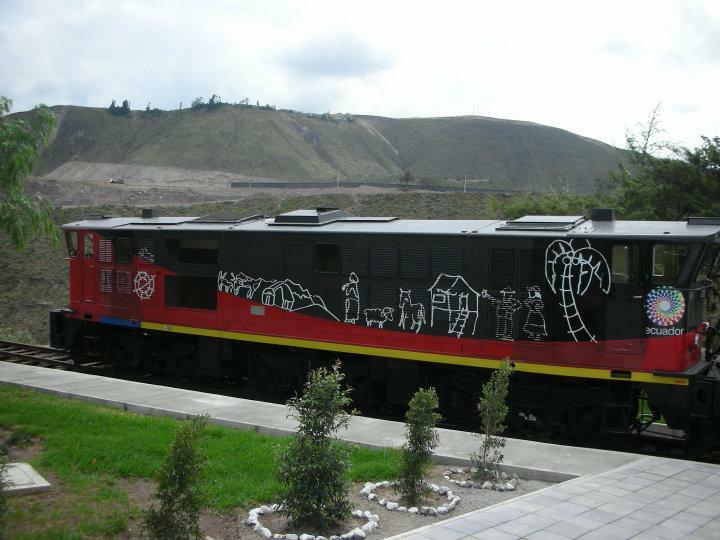 Our train climbed through sugarcane plantations, wonderful landscapes, and lush agricultural areas where tomatoes, broccoli, cabbages, potatoes, corn, bananas, and quinoa are grown. We traveled through mountains, valleys, waterfalls and tunnels. We crossed bridges that spanned canyons and gullies. We arrived at the completely indigenous town of Salinas and were greeted with a dance display by native Ecuadorian girls of African descent. We walked through the little community, visited their small Catholic Church and toured the Salt Museum. I was not excited about the prospect of visiting a salt museum - after all how can anything be more mundane than salt, but it was actually a very interesting little excursion, perhaps one of the highlights of the day, made very interesting by the young woman guide we had for this village. Lunch was included in today's trip. It was served in a restaurant completely run by people of the community and it was delicious! It included a brothy soup made with ground dried corn and pork. The main course was a slice of pork, grilled plantain, white rice and salad. We also tried some of the local ice cream. Stan had chocolate. I, always the adventurous one when it comes to food, had avocado. It was heavenly - Stan had his and half of mine. Tomorrow, we look forward to a city tour and a visit to the Middle of the World.